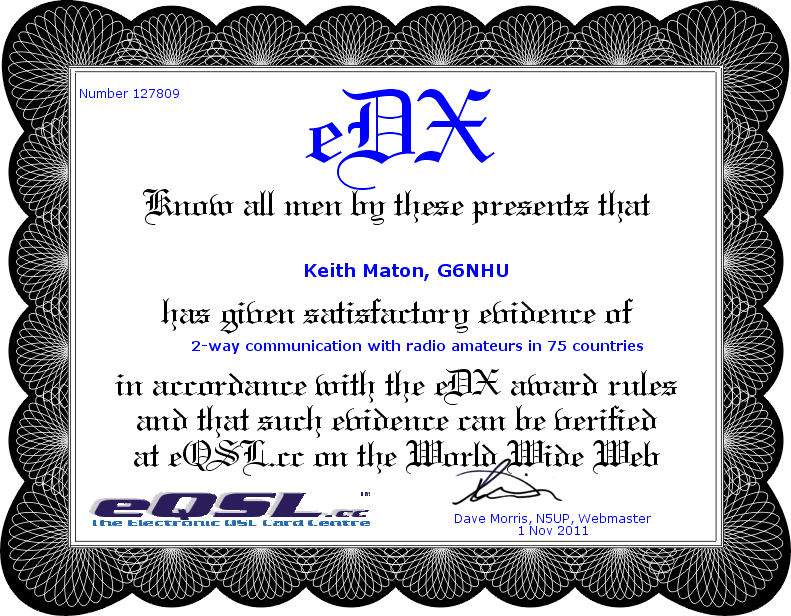 I don’t actually log onto eQSL too often but I did a couple of days ago and realised that I’d reached 75 confirmed countries via their Awards page so I requested and duly received the appropriate certificate. The general perception is that there are more people actively uploading to eQSL than there are to LoTW and a quick check of my logbook agrees with that. I have received 820 QSLs via LoTW and 990 via eQSL but clearly the diversity of countries and entities uploading to LoTW is greater as I have 91 DXCC entities confirmed on LoTW as opposed to just 75 on eQSL. I’ve said before that I consider the ARRL DXCC to be the ‘real’ DXCC and I’m clearly not alone in that. Having said that, it’s nice to keep a count on both systems and I’ll be very happy to reach 100 entities confirmed on both systems in due time. This may not seem many to the hardened DXers around but chasing countries is a new experience for me and one which I’m enjoying. On day #304, the first day following the massive CQWW SSB contest I had just two QSOs, both on 20m PSK with UR8MH, Anatoliy and UR5FS, Vladimir. I had three contacts on day #305 and I plugged the microphone back in after yesterday. I first worked RA3YRA, Victor on 20m PSK and then spoke to 9H1NB, Ben on 12m. Rounding up the day was another PSK QSO, this time with IK7BEF, Antonio on 15m. I had reason to visit the doctor on the morning of day #306 and when I got home I had another quick shout on 20m PSK where I worked RX3DTN, Dima and YU7AS, Adam. After that I tuned over to 15m to work TU2T, a DXPedition to the Cote D’Ivoire (Ivory Coast) for a new DXCC. I then spoke to EA9IE, Juan on 12m and finished off the day having a 20m QSO via long path with VK6ANC. This entry was posted in Amateur radio, HF, New DXCC, PSK, QSO365, SSB and tagged arrl dxcc, cqww ssb contest, dxcc entities, eqsl, QSO365. Bookmark the permalink.